James Meredith will become the new principal of Pope John Paul II High School in Royersford July 1. The archdiocesan Office of Catholic Education and Faith in the Future Foundation made the announcement June 9. 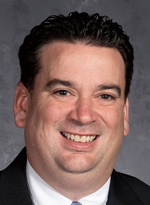 Meredith has served at Archbishop Ryan High School in Philadelphia as a teacher and administrator for the past 14 years, including his current position as principal since 2013. His appointment follows the retirement of Pope John Paul II’s current principal, Sister Janet Purcell, I.H.M., who is retiring after 54 years of service to Catholic education. Giuliano called Pope John Paul II “a vibrant example of Catholic education in Montgomery County and the Archdiocese of Philadelphia,” and he looked forward to Meredith’s arrival. “Additionally, we are grateful to Sister Janet for her tireless dedication and service to our students, faculty and staff and we offer her prayerful best wishes for her much deserved retirement,” Giuliano said. Meredith holds his Bachelor of Arts degree in politics from De Sales University as well as a master’s degree in educational leadership from Cabrini College. Prior to his time serving Archbishop Ryan High School, he was a teacher at Msgr. Bonner and Archbishop Prendergast High School and a fifth grade teacher at St. Katherine of Siena School in Northeast Philadelphia. Additionally, he served as a staff writer for the sports department of the Intelligencer Newspaper in Doylestown. Meredith and his wife, Kate, have five daughters and reside in St. Cecilia Parish in Northeast Philadelphia.